Clayton Thorson tries to evade a defender. The sophomore quarterback fumbled twice in Northwestern's loss to Minnesota. MINNEAPOLIS — Any Northwestern bowl-eligibility celebration will have to wait at least one more week. 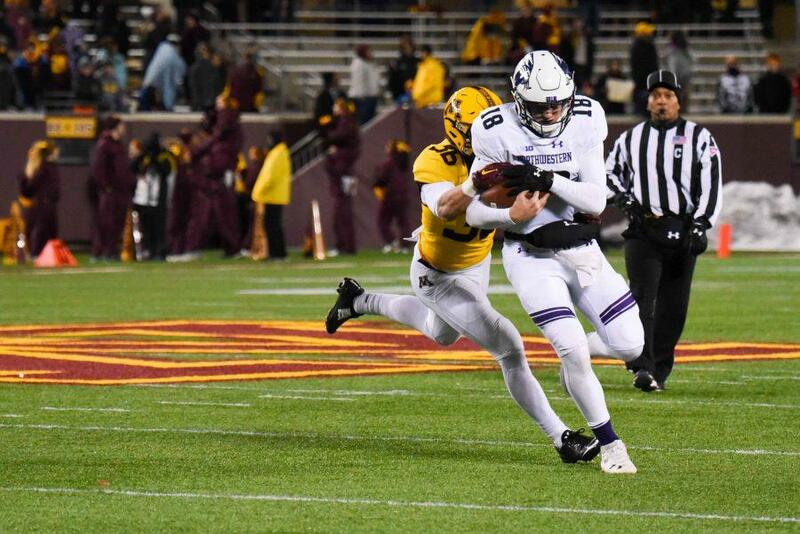 Sloppy offensive play doomed the Wildcats (5-6, 4-4 Big Ten) against Minnesota (8-3, 5-3) on Saturday as Northwestern fell 29-12, missing a chance to earn the sixth win that would have guaranteed the team a spot in postseason play. For the first time in more than two months, the Wildcats were held scoreless in the first half. Minnesota took a six-point lead with a touchdown on its opening drive and never relinquished the lead. “(We) didn’t give ourselves a whole lot of opportunity today offensively,” coach Pat Fitzgerald said. NU threatened at various points in the second half but fell short time and time again. After the Cats’ first touchdown cut the deficit to 15-6 late in the third quarter, junior linebacker Anthony Walker pilfered the ball from Minnesota returner Jalen Myrick on the ensuing kickoff, setting NU up at the Golden Gophers’ 22-yard line. Instead of capitalizing on the break, the Cats came up short on a fourth-and-one moments later. Another defensive stop gave NU the ball at midfield a few minutes later, but again the Cats stalled, punting it away after gaining just seven yards. After the game, Fitzgerald said offensive line difficulties played a major role in the rocky offensive performance. NU ran the ball for just 63 yards on 33 carries, with those numbers reflecting the line’s struggles to protect quarterback Clayton Thorson. The sophomore was sacked seven times and fumbled twice. Thorson did manage to rack up 276 passing yards and a late touchdown pass to sophomore wide receiver Flynn Nagel that cut the deficit to 10, though it was quickly rendered meaningless when the Cats failed on a two-point conversion that would have made it a one-possession game. The sacks and a long day for the team’s wide receivers, who dropped numerous passes and had difficulties getting open, combined to produce an anemic passing game. Nagel said the receivers need to work on being quicker with their routes. The departure of senior Austin Carr with a third-quarter injury made things more difficult for the Cats in the second half. NU’s leading receiver was injured in a helmet-to-helmet collision with Minnesota defender Duke McGhee, who was ejected for targeting. Fitzgerald said Carr “seemed to be doing well” after the game. It took NU too long to find its rhythm against Minnesota on a cold, windy evening, as it trailed 12-0 at halftime and 15-0 late into the third quarter. Though the Cats have shown an ability to bounce back from slow starts on the road before, they were unable to climb out of the hole they dug this time. “We’ve got to be able to pivot and keep playing,” senior defensive end C.J. Robbins said. The loss gives the team’s season finale against Illinois even greater meaning, as it will determine whether NU finishes the season bowl-eligible.